While millions of men died in France and Belgium in 1915, battles equally as large and bloody were being fought on the Eastern Front, as Imperial Germany, Hapsburg Austria-Hungary, and Tsarist Russia clashed on a scale greater than anything seen on the Western Front. These massive offensives were shocking in their scale and intensity, and hugely important. Yet they are largely ignored in the West. Now, with the work of internationally renowned Eastern Front expert Prit Buttar, this story of the unknown side of World War I is finally being told. 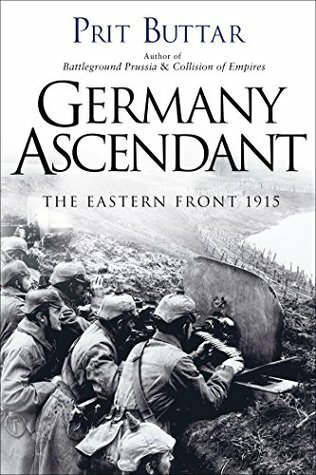 In Germany Ascendant, Buttar examines the critical year of 1915, when Germany launched the great Gorlice-Tarnow Offensive, lead by Field Marshal Mackensen. The move, which started as a minor German operation to relieve their Austro-Hungarian allies, ultimately resulted in the utter collapse of Russian forces from all of Poland and Gallacia, and came tantalizingly close to knocking Russia out of the war altogether. Next the Germans led the invasion of Serbia, leading Britain and France to intervene with ground troops, an operation that ultimately failed. Yet despite this unbroken string of successes, Germany was still hamstrung by a two-front war. Her every attempt to knock Russia out of the war--military and diplomatic--has failed. The stage was then set for the next phase of the war when Russia launched its own counter-offensive that nearly brought the Central Powers to their knees.